Masters Win at City of Oxford Royal Regatta. 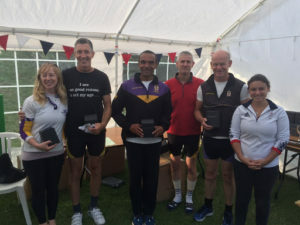 Last weekend saw success for the men’s masters squad with a win in the Masters D/E4+ at the 2017 City of Oxford Royal Regatta. The YCRC MasE4+ crew of Hugh Dawick, Mike Porte, Martin Walsh and Neil Paveley coxed by Robyn Inglis, made the 400 mile round trip south as a final sharpener before the World Masters Regatta in Bled, Slovenia, in September. After a convincing win in the semi finals over Reading’s E4+, and despite waiving their handicap against Monmouth’s D4+ in the final, the crew cruised home to victory, rounding off an enjoyable day at a friendly regatta. Bring on Bled!